Intel X86 500Mhz or higher compatible processor; 1GB or more RAM; 1GB or more of free Hard Disk space; Windows/2000/XP/Vista/Windows 7 SP1 (32 and 64 bit); CD/DVD drive. Probably one of the most disastrous things to strike your PC is a hard drive crash. One minute you are hard at work and the next your PC has stopped responding. It is at this point that the first thing you do is panic. It is also at times like this that you hear a voice in your inner most consciousness saying, I told you that you should have backed up your system. Strangely, this is an all too familiar scenario. Everyone thinks they are infallible when it comes to the dreaded hard disk crash; sadly, though, this is not the case; there are none of us safe from a system crash. However, we can do something to make life easier should a system crash occur and that is to backup or clone our hard drive and, frankly, there is no better way of doing this than by using EaseUS Todo Backup Workstation. EaseUS Todo Backup Workstation has a clean tabbed user interface enabling the user to see at a glance exactly what the application does. 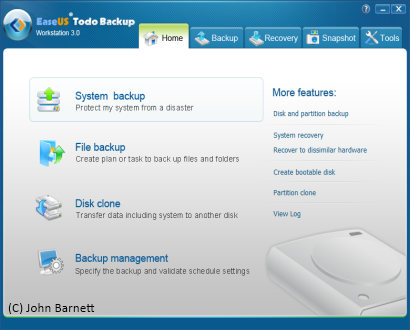 The interface is divided into five main tabbed divisions; Home, Backup, Recovery, Snapshot, and Tools with the GUI defaulting to the Home tab. The Home tab contains the most obvious backup options for system, file and cloning the hard drive. Each option is a simple one click operation and you are guided through each sequence by a set of intuitive screens. You also have the option, either from the backup window or once a backup has been created, for EaseUS Todo to check the backup's integrity just in case any problems occurred during the initial backup process. This is a useful feature and should be used at all time to ensure that all backups are safe. Recovering backup images is just as easy as creating them. Once the relevant file is selected your machine powers down and then opens in a pre-windows environment where all of the recovery steps are executed. Interestingly EaseUS Todo Backup Workstation's recovery contains an option to recover backups to dissimilar hardware thus enabling the user to recover an imaged backup to an alternative drive or alternative PC without the usual hassle of actually having to re-install the whole operating system. 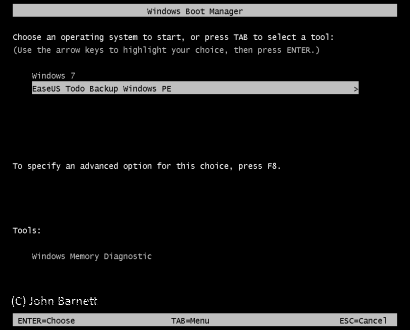 While it is a simple matter to create an EaseUS Todo Backup Workstation recovery CD it is also possible to add a link to the pre windows environment to the boot record of your computer. To do this you simple click on the Tools tab and then click the Enable PreOS option. The next time you boot your computer a menu will appear asking if you wish to boot into Windows or the EaseUS PreOS environment. This option is similar and quicker than actually relying upon a recovery CD. However, it should be stressed that enabling the PreOS option doesn't guarantee complete safety from backup disaster. It should be remembered that, should your PC's hard drive crash, you may not have access to the PreOS environment, thus you will be unable to recover any backup that you have made. For this reason always ensure that, as well as enabling the PreOS option, you also create an EaseUS Todo Backup recovery CD. A snapshot is the state of your system at a particular time. In effect it is very similar to Windows own System Restore allowing you to install software onto your system and, should the software become troublesome, simply revert back to your PCs original state. There is a lot talked about virtual machines nowadays and, to be honest, VMs are a God send when it comes to trying out new operating systems in what is technically called a sandbox situation. 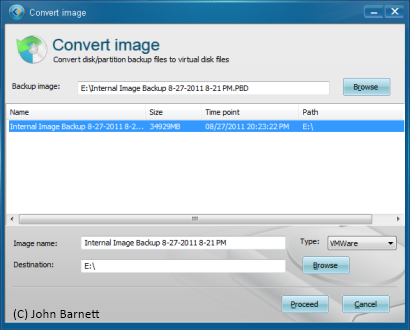 EaseUS Todo Backup Workstation can help create a VM disk by allowing you to convert an imaged drive or partition into VMDK/VHD file format. While the conversion to VMDK/VHD is pretty straightforward we actually found it quite disappointing. It is not, for instance, documented that, if you are using VMware Workstation or VMPlayer you must install the VMware Virtual Development Kit prior to attempting to convert a backup. Also once the conversion has been completed it is not a simple matter to load the VM into VMware Workstation or VMPlayer. Instead, in our case, we had to physically create a new virtual machine and then, during the creation process, direct the new VM to use the converted VMDK file as the guest operating system. Unfortunately when we attempted to use the converted backup file as a VM all we managed to get was a blue screen of death. When it comes to backing up or cloning your hard drive you really do need an application that you can trust. While there are numerous backup applications available not all perform as they should do and there is nothing worse than creating a backup/image only to find that when you need it, it fails to perform as it should. The de-facto backup/cloning application is probably Acronis True Image. In fact we ourselves have been regular users of Acronis. However, we must admit that since using EaseUS Todo Backup Workstation on a regular basis our option has somewhat changed. 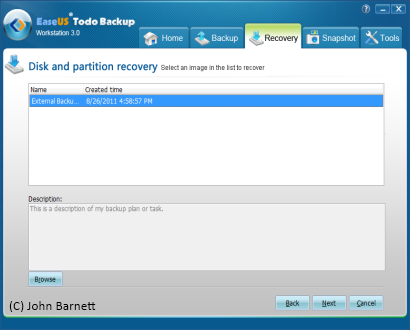 We found EaseUS Todo Backup Workstation an excellent backup/cloning application. It is capable of creating standard, differential and incremental backups at the touch of a button and is both easy to use and, more importantly, user friendly. We highly recommend EaseUS for backing up your valuable files and disk drives. In our opinion it is time for Acronis to step aside and make way for EaseUS Todo Backup Workstation.